So until the November start of their tour with Machine Head this is the last of Megadeth for now. This interview is actually kinda creepy. 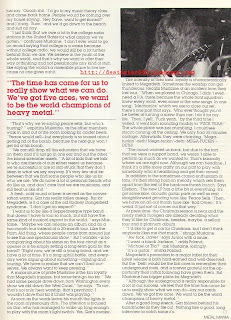 I remember reading it when it was published and not even blinking about [Killing/Peace] Drummer Gar Samuelson "falling asleep" during this whole interview. 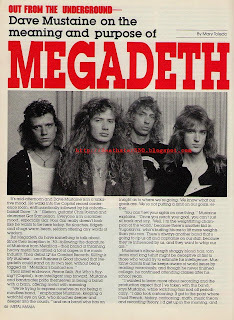 Knowing what we know now and how the early Megadeth line up struggled with substances, it's just a little weird, especially with the interviewer calling him out like that. But for those of you who are fans of the classic line up of Mustaine, Ellefson, Samuleson and Chris Poland it's a decent interview.